Once again around 30 people gathered at the Said Business School for the third workshop in this academic-practitioner research project exploring the designing of services in science and technology-based enterprises. This time, each project pair (one design consultancy + one enterprise) presented individually what they had done, to date, in their engagement with each other. This was followed by questions and feedback from the wider group including academics from both design and management studies. What was striking was how representatives from two of the four science-based enterprises - who in their comments at the previous workshop in January following the designers' presentations questioned the evidence of a "process" in what they had heard - were now enrolled in their designers' project. 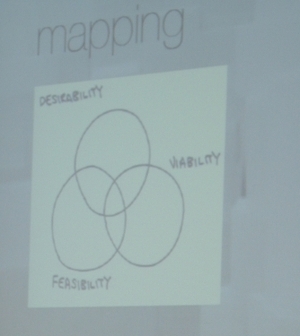 The photo shows a hand-drawn diagram from a digital presentation by the two IDEO designers, showing how that consultancy frames the opportunity: at the intersection of desirability (design), viability (business) and feasibility (technology). Following this event, the pairs will continue to work together in the way they agree, with some of the process observed by academics and some of it filmed. The pairs' final presentation of their work together and what they made of it will be at the next project workshop on July 2.